Do you keep old clothes in case you want to use them as fabric for sewing projects? I do, even though I rarely do any sewing. The other day while cleaning, I found a heap of old white shirts and forced myself to do something about them. To either discard them or cut them into pieces for sewing projects. Oh my god, such a big step, right. But I saw great possibilities in them at some point, and it was finally time to take them to the next level. I cut the clothes, and this got me really excited about sewing. Easy sewing, that is. So I decided to make drawstring pouches with simple embroidery. My last embroidery project was this pillow. The patterns are from the same book, with the left one being Salvia's design and the right two being traditional Japanese patterns. I'm quite pleased with the result.. And valuable lesson learned: if saving a piece of clothing for future fabric use, I should have it cut into pieces first. Turn them from possibilities into actual materials ready to go. Anyway, it feels good to have turned something old into something new that is pretty and functional. 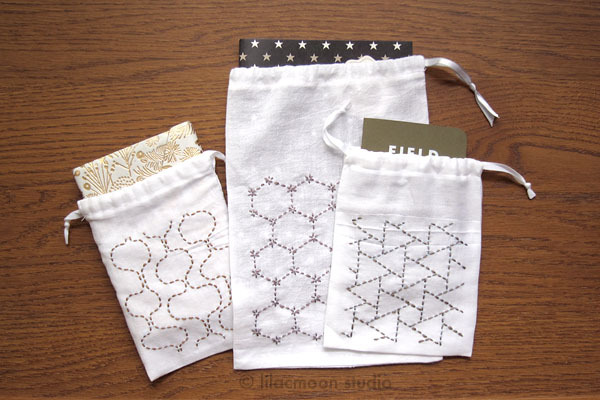 I will master making drawing pouches.. Fabric scraps, I haz them. What a lovely pouch. You chose such pretty fabric! I think these will make a nice giveaway for a wedding.